IC 3583 is a magnitude +13 irregular galaxy located 30 million light-years away in the constellation of Virgo close to the border with Coma Berenices. IC 3583 is thought to be gravitationally interacting with one of its neighbours, the spiral Messier 90. Note that the backdrop to IC 3583 is strewn with large numbers of more distant galaxies of the Virgo Cluster. Image credit: ESA/Hubble & NASA. 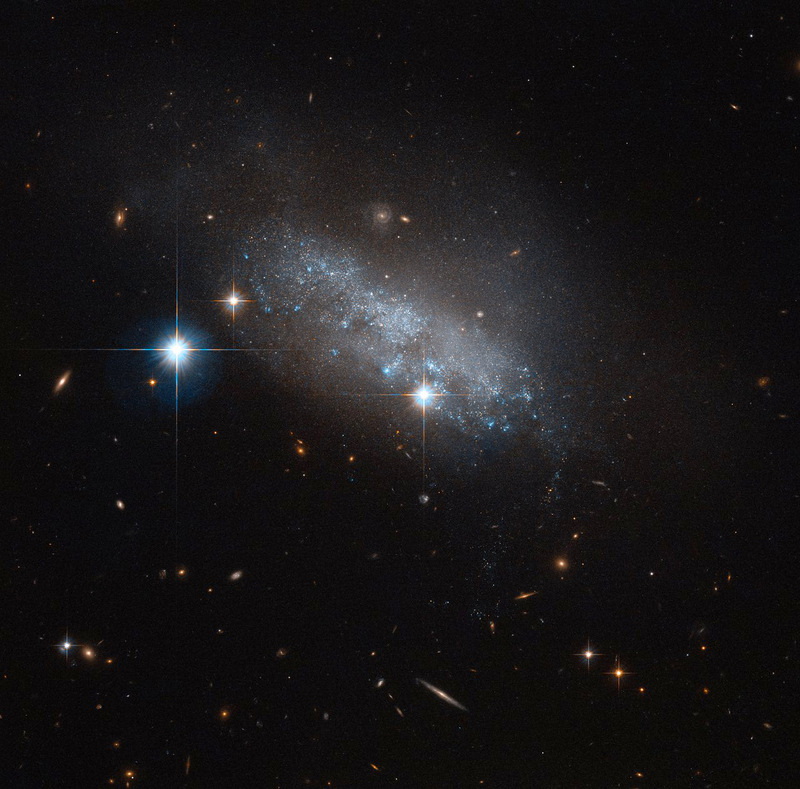 This delicate blue group of stars — actually an irregular galaxy named IC 3583 — sits some 30 million light-years away in the constellation of Virgo. It may seem to have no discernable structure, but IC 3583 has been found to have a bar of stars running through its centre. These structures are common throughout the universe, and are found within the majority of spiral, many irregular, and some lenticular galaxies. Two of our closest cosmic neighbours, the Large and Small Magellanic Clouds, are barred, indicating that they may have once been barred spiral galaxies that were disrupted or torn apart by the gravitational pull of the Milky Way. Something similar might be happening with IC 3583. This small galaxy is thought to be gravitationally interacting with one of its neighbours, the spiral Messier 90. Together, the duo form a pairing known as Arp 76. It’s still unclear whether these flirtations are the cause of IC 3583’s irregular appearance — but whatever the cause, the galaxy makes for a strikingly delicate sight in this NASA/ESA Hubble Space Telescope image, glimmering in the blackness of space. 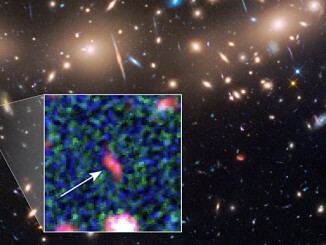 Astronomers harnessing the combined power of NASA’s Hubble and Spitzer space telescopes have found the faintest object ever seen in the early universe. It existed about 400 million years after the big bang, 13.8 billion years ago. The new object is comparable in size to the Large Magellanic Cloud (LMC), a diminutive satellite galaxy of our Milky Way. 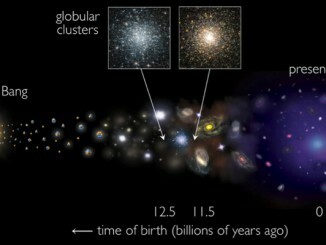 Using a new age-dating method and the W. M. Keck Observatory, an international team of astronomers have determined that globular star clusters formed in two distinct epochs — 12.5 and 11.5 billion years ago. They formed alongside galaxies, rather than prior to galaxies, as previously thought. 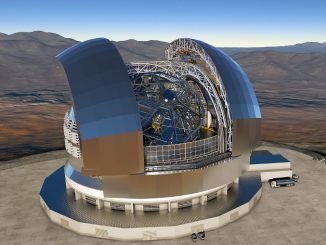 At a ceremony held today in Germany, the European Southern Observatory and the ACe Consortium signed the largest contract ever in ground-based astronomy for key components of the 39-metre aperture European Extremely Large Telescope (E-ELT). The 85-metre-diameter, 5000 tonne dome and telescope structure will take telescope engineering into new territory.